Objectives: Despite the scientific evidence of reducing cardiac events with HMG Co-A reductase inhibitors (statins) therapy in both primary and secondary preventions, these therapies continue to be underutilized in patients receiving convictional care. Simvastatin, a HMG Co-A inhibitor agent, is the most commonly used statin in Sultan Qaboos University Hospital. The aim of this study is to review the safety and the effectiveness of achieving LDL-C targets with Simvastatin according to the NCEP-ATP3 guidelines in patients with different cardiovascular risk categories at Sultan Qaboos University Hospital. Methods: A retrospective chart review was conducted for 160 patients. Patients were identified by outpatient prescriptions provided by pharmacy department from April 2008 to May 2008. Results: 98% of the patients were prescribed simvastatin 20 mg and only 2% received 40 mg. The mean age of patients was 57 years +/- 12. While 49% of the patients were male and 45% had diabetes mellitus, 50% had cardiovascular disease, 2.5% were smokers, 67% were hypertensive, and 3% had positive family history of coronary artery disease. 75% of patients were classified as high risk, 7% moderate risk and 18% low risk for coronary artery disease. Among all lipid profiles, only LDL-C was changed from baseline with simvastatin treatment in all patients (3.60±1.03 to 3.25±1.34 mmol/L). LDL-C level at baseline was higher in the high risk group (4.11±1.06 mmol/L) compared to low and moderate risk groups (3.68±0.89, 3.42±1.15) respectively. Achievement of LDL-C goals was achieved in only 43% for high risk, 50% in moderate risk, and 90% in low risk patients. There was no significant increase in liver enzymes and creatinine kinase. Conclusion: This study identified that more than half of the high risk patients were not at the target LDL-C goals which place them at a continuous risk of coronary heart disease. More appropriate lipid lowering therapy using more potent statins or combination therapy should be optimized to improve achievement of LDL-C goals according to ATP-III guidelines. From the 1Department of Pharmacy, Qatar Heart Center, Qatar; 2Department of Internal Medicine, SQUH; 3Department of Clinical Biochemistry, SQUH; 4Department of Clinical Pharmacy SQUH; 5Department of Internal Medicine, College of Medicine and Health Sciences, SQU; 6Department of Pharmacology and Clinical Pharmacy, College of Medicine & Health Sciences, SQU. Address correspondence and reprint request to: Dr. Khalid Al-Rasadi, Department of Clinical Biochemistry, Sultan Qaboos University Hospital, Al Khod, Sultanate of Oman. Al-Siyabi K, Farhan H, Al-Rasadi K, Al-Salhi A, Al-Hinai AT, Al-Zakwani I. Safety of simvastatin and goal attainment for low-density lipoprotein cholesterol in Sultan Qaboos University Hospital. OMJ Oct 2010; 25(4):264-268. Based on these evidence, NCEP-ATP III updated guidelines recommended to decrease LDL-C to less than 2.6 mmo/l in high risk patients (patient with established coronary artery disease, CAD risk equivalents and estimated 10 years risk for myocardial infarction (MI) more then 20%).12 In patients with very high risk (those with established coronary artery disease and either diabetes mellitus (DM), smoking, metabolic syndrome and acute coronary syndrome) LDL-C should decrease below 1.8 mmo/l as an optional target.12 European guidelines recommend a target LDL-C of <2.5 mmol/L in patients with CAD. The American and Canadian guidelines on the other hand, recommend a target LDL-C of < 2.0 mmol/L in these patients. This study was conducted to evaluate the safety and the effectiveness of achieving LDL-C targets with Simvastatin according to the NCEP-ATP III guidelines in patients with different risk categories at Sultan Qaboos University Hospital. This study was a retrospective chart review carried out between April 2008 and May 2008. Patients on simvastatin were identified by reviewing prescriptions provided by the outpatient pharmacy department. Patients were included if they were >18 years of age, and completed a minimum of three months simvastatin therapy. Patients were classified into mild, moderate and high risks for cardiovascular event according to NCEP-ATP-III guidelines based on the presence of one or more cardiovascular risk factors, presence of diabetes, and calculated Framingham risk score. Patients were excluded if they received combination of lipid lowering agents. The results of lipid values (total cholesterol (TC), triglycerides (TG), LDL-C and HDL-C) were measured at SQU biochemistry laboratory. TC and TG were measured by enzymatic, colorimetric methods. HDL-C and LDL-C were measured by homogeneous enzymatic colorimetric methods. Lipid results were obtained from the laboratory information system before statin treatment and a minimum of 3 months after treatment. Adverse events were obtained from laboratory data (measurements of ALT and CK). No clinical signs or symptoms were reviewed. For categorical variables, frequencies and percentages were reported and for continuous variables, means and standard deviations (±SD) were presented. Mean differences between groups were analyzed using paired t‑tests. An a priori two-tailed level of significance was set at the 0.05 level. Statistical analysis was performed using STATA version 9.1 software. 224 prescriptions were reviewed over one week. A total of 160 patients were included (78 males and 82 females). A total of 64 patients were excluded; 44 patients of whom used simvastatin for <3 months, 14 patients were shifted from fluvastatin to simvastatin, 2 patients were <18 years and 4 patients used simvastatin with fenofibrate. Baseline characteristics of all patients are summarized in Table 1. Mean age was 57±12 years, and mean weight 73.4±15.9 kg. 72 patients (45%) were diagnosed with cardiovascular disease and co-diagnoses with myocardial infarction and angina being the most common diagnoses. 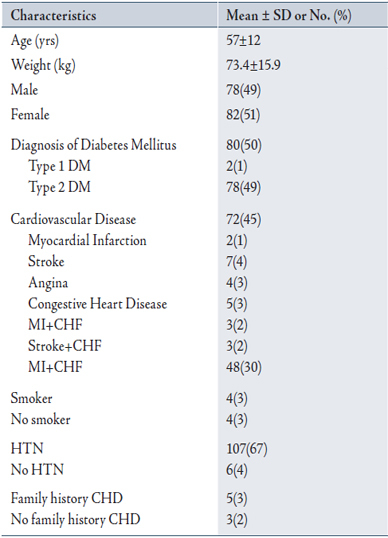 80 patients (50%), had diagnosis of DM (2 with type 1 DM, 78 with type 2 DM), 107 (67%) had hypertension, 4(2.5%) were smokers and 5(3%) had family history of CAD. The majority of patients were high risk patients (75%). 7% of the patients were moderate risk and 18% were low risk. Duration of treatment was >12 months in 113 (71%) and between 3-12 months in 47 (29%) of the patients. Almost all patients received simvastatin dose of 20 mg in (98%) and 40 mg dose in only 2% of the patients. LDL-C concentration prior to simvastatin treatment (pre-index) was available for 58 (36%) patients, 79 (49%) patients for post-treatment (post-index) and for 30 (19%) pre and post index. Table 2 summarizes the lipid profile at baseline and post treatment for the 160 patients according to their risk groups. LDL-C concentration decreased significantly for all groups after treatment (3.60±1.03 to 3.25±1.34 mmol/L). The mean LDL-C in the high risk group was 4.11±1.06 mmol/L pre-treatment and 3.38±1.28 mmol/L post-treatment. LDL-C level at baseline was higher in the high risk group (4.11±1.06 mmol/L) compared to low and moderate risk groups (3.68±0.89, 3.42±1.15). In high risk patients, 22/51(43%) reached LDL-C target of <2.60 mmol/L. In the moderate risk group, 4/8(50%) reached LDL-C target of <3.40, and in the low risk group, 18/20 (90%) achieved LDL-C target of <4.10. ALT was available for 83(52%) pre-index, 101(63%) post-index and for 49(31%) pre and post-index. Compared to baseline, ALT did not change significantly post-treatment with simvastatin (from 24±19 to 23±20). CK measurements were available in 4(2.5%) pre-index with mean 79±39 IU/L, 6(3.7%) post-index with mean 102±56 IU/L and no documentation for pre and post-index. In this study, 43% of the high risk patients achieved LDL-C target of <2.6 mmol/L. Compared to other studies, data from the Lipid Treatment Assessment Project (L-TAP) study showed an overall 37% of high risk patients achieved NCEP-specified LDL-C target level.13 In the L-TAP study, the success rate for the high risk patients on simvastatin was 50%. This is still a low percentage for LDL-C attainment. Also, it was observed that 49% of patients had no post-index LDL-C level to be evaluated. The reasons for low percentage of goal achievement in general may result from initiating at the wrong dose, inappropriate choice of drug, physician not adhering to guidelines, drug tolerability by patients and noncompliance. In the current study, patient compliance was not examined, but it was apparent that 49% of patients had no post-index LDL-C level to be evaluated which could partly be explained by physicians not adhering to guidelines or poor patient compliance. It was also revealed that 71% of the patients were on simvastatin for >12 months and 98% were on a low starting dose of 20 mg. The doses of simvastatin were not titrated to a maximum dose to reach the LDL-C targets. The mean LDL-C at baseline for the high risk group was higher than the LDL-C levels in low and moderate risk groups. To achieve LDL-C target of <2.6 mmol/L in this group, LDL-C should be decreased at least by 40% and simvastatin at 40 mg would be an appropriate starting dose. The efficacy of colesevelam, a unique bile acid sequestrant has been evaluated in combination with statins.18 The administration of 6 tablets of colesevelam with statins has been shown to result in an approximate 10-16% further reduction in LDL-C levels, favorable effects upon HDL-C levels, and mild to moderate elevations in triglyceride levels.19,20 The combination of niacin with statins have complementary benefits on multiple lipoprotein parameters, especially HDL. During the period of this study, simvastatin and fenofibrate were the only medications available at SQUH. In the Effectiveness and tolerability of simvastatin plus fenofibrate for combined hyperlipidemia (SAFARI) trial, combination therapy of fenofibrate 160 mg and simvastatin 20 mg resulted in additional decreased TG by 43%, increased HDL-C by 18.6% and decreased LDL-C by 31.2% compared to simvastatin 20 mg monotherapy.23 Higher rate of drug-related adverse events were also observed. Only patients on simvastatin monotherapy were evaluated and patients on combination therapy were excluded in this study. Common side effects associated with the use of statins are elevated aminotransferase levels >3 times the upper limit of normal, (incidence of <1% in low-moderate statins dose and 2-3% in higher dose). These elevations are related to the dose of statins but not to the reduction of LDL-C. Severe liver injury is rare and the elevation of the aminotransferases is most often transient and will resolve spontaneously in 70% of cases even if the statins and doses are continued unchanged. The cause of elevation in liver transaminase levels is not well understood but proposed mechanisms, including a transient pharmacologic effect secondary to cholesterol reduction in hepatocytes, comorbid conditions such as diabetes mellitus and obesity, and the consumption of alcohol or non-statin medications. The most prevalent side effect with statin therapy is myalgia (1.5-3%). Serious muscle toxicity and rhabdomyolysis are rare (occurs in 5 patients per 100,000 person-years and rhabdomyolysis in 1.6 patients per 100,000 person-years). In this study, there were no significant increases in liver enzymes and CK levels in patients treated with simvastatin. Overall, this study showed that more than half of the high risk patients are not at target for LDL-C goals which place them at a continuous risk for CHD and their lipid lowering therapy using statins or combination therapy should be optimized to improve the chances of achieving LDL-C goals. 1. Yusuf S, Hawken S, Ounpuu S, Dans T, Avezum A, Lanas F, et al. Effect of potentially modifiable risk factors associated with myocardial infarction in 52 countries (the INTERHEART study): case-control study. Lancet 2004; 364(9438):937-952. 2. Verschuren WMM, Jacobs DR, Bloemberg BP, Kromhout D, Menotti A, Aravanis C, et al. Serum total cholesterol and long-term coronary heart disease mortality in different cultures. Twenty-five year follow-up of the seven countries study. JAMA 1995; 274(2):131-136. 3. Chen Z, Peto R, Collins R, MacMahon S, Lu J, Li W, et al. Serum cholesterol concentration and coronary heart disease in population with low cholesterol concentrations. BMJ 1991; 303(6797):276-282. 4. O’Keefe JH, Cordain L, Harris WH, Moe RM, Vogel R. Optimal low-density lipoprotein is 50 to 70 mg/dl. Lower is better and physiologically normal. J Am Coll Cardiol 2004; 43(11):2142-2146. 5. MRC/BHF Heart Protection Study Collaborative Group.MRC/BHF Heart Protection Study of cholesterol lowering with simvastatin in 20 536 high-risk individuals: a randomised placebocontrolled trial. Lancet 2002; 360(9326):7-22. 6. Cholesterol Treatment Trialists’ Collaborators. Efficacy and safety of cholesterol lowering treatment: prospective meta-analysis of data from 90 056 participants in 14 randomized trials of statins. Lancet 2005; 366(9493):1267-1278. 7. LaRosa JC, Grundy SM, Waters DD, Shear C, Barter P, Fruchart JC, et al. Intensive lipid-lowering with atorvastatin in patients with stable coronary disease. N Engl J Med 2005; 352(14):25-35. 8. Pedersen TR, Faergeman O, Kastelein JJ, Olsson AG, Tikkanen MJ, Holme I, et al. High-dose atorvastatin vs usual-dose simvastatin for secondary prevention after myocardial infarction: the IDEAL study: a randomized controlled trial. JAMA 2005; 294(19):2437-2445. 9. Cannon CP, Braunwald E, McCabe CH, Rader DJ, Rouleau JL, Belder R, et al. Intensive versus moderate lipid lowering with statins after acute coronary syndromes. N Engl J Med 2004; 350(15):1495-1504. 10. Shah SJ, Waters DD, Barter P, Kastelein JJ, Shepherd J, Wenger NK, et al. Intensive Lipid-Lowering With Atorvastatin for Secondary Prevention in Patients After Coronary Artery Bypass Surgery. J Am Coll Cardiol, 2008; 51:1938-1943. 11. Josan K, Majumdar SR, McAlister FA .The efficacy and safety of intensive statin therapy: a meta-analysis of randomized trials. CMAJ 2008; 178(5):576-584. 12. Grundy SM, Cleeman JI, Merz CN, Brewer HB Jr, Clark LT, Hunninghake DB, et al. National Heart, Lung, and Blood Institute: American College of Cardiology Foundation; American Heart Association. Implications of recent clinical trials for the National Cholesterol Education Program Adult Treatment Panel III guidelines. Circulation 2004; 110(2):227-239. 13. Pearson TA, Laurora I, Chu H, Kafonek S. The Lipid Treatment Assessment Project (L-TAP). Arch Intern Med. 2000; 160(4):459-467. 14. Gagné C, Bays HE, Weiss SR, Mata P, Quinto K, Melino M, et al, for the Ezetimibe Study Group. Efficacy and safety of ezetimibe added to ongoing statin therapy for treatment of patients with primary hypercholesterolemia. Am J Cardiol 2002; 90(10):1084-1091. 15. Ballantyne CM, Blazing MA, King TR, Brady WE, Palmisano J. Efficacy and safety of ezetimibe co-administered with simvastatin compared with atorvastatin in adults with hypercholesterolemia. Am J Cardiol 2004;93 (12):1487-1494. 16. Fleg JL, Mete M, Howard BV, Umans JG, Roman MJ, Ratner RE, et al. Effect of Statins Alone Versus Statins Plus Ezetimibe on Carotid Atherosclerosis in Type 2 Diabetes.The SANDS (Stop Atherosclerosis in Native Diabetics Study) Trial. JACC 2008; 52(25):2198-2205. 17. Kastelein JJ, Akdim F, Stroes ES, Zwinderman AH, Bots ML, Stalenhoef AF, et al. Simvastatin with or without ezetimibe in familial hypercholesterolemia. N Engl J Med 2008; 358:143-143. 18. Davidson MH, Toth P, Weiss S, McKenney J, Hunninghake D, Isaacsohn J, et al. Low-dose combination therapy with colesevelam hydrochloride and lovastatin effectively decreases low-density lipoprotein cholesterol in patients with primary hypercholesterolemia. Clin Cardiol 2001; 24(6):467-474. 19. Knapp HH, Schrott H, Ma P, Knopp R, Chin B, Gaziano JM, et al. Efficacy and safety of combination simvastatin and colesevelam in patients with primary hypercholesterolemia. Am J Med 2001; 110(5):352-360. 20. Hunninghake D, Insull W Jr, Toth P, Davidson D, Donovan JM, Burke SK. Coadministration of colesevelam hydrochloride with atorvastatin lowers LDL cholesterol additively.Atherosclerosis 2001; 158(2):407-416. 21. Bays HE, McGovern ME. Once-daily niacin extended-release/lovastatin combination tablet has more favorable effects on lipoprotein particle size and subclass distribution compared to atorvastatin and simvastatin. Prev Cardiol 2003; 6(4):179-188. 22. Brown BG, Zhao XQ, Chait A, Fisher LD, Cheung MC, Morse JS, et al. Simvastatin and niacin, antioxidant vitamins, or the combination for the prevention of coronary disease.N Engl J Med. 2001; 345 (22):1583-1592. 23. Grundy SM, Vega GL, Yuan Z, Battisti WP, Brady WE, Palmisano J. Effectiveness and tolerability of simvastatin plus fenofibrate for combined hyperlipidemia (the SAFARI trial). Am J Cardiol. 2005 Feb 15; 95(4):462-468. 24. McKenney JM, Davidson MH, Jacobson TA, Guyton JR. National Lipid Association Statin Safety Assessment Task Force Final conclusions and recommendations of the National Lipid Association Statin Safety Assessment Task Force. Am J Cardiol 2006; 97(8):89-94.